Our planet’s fragility and humanity’s vulnerability are increasingly laid bare through environmental and social concerns that challenge our generation. Prevailing social and economic development models can no longer remain indifferent to these realities. Meeting the challenge of a sustainable world requires a practical reckoning and an attitude of care to engage the complexity of poverty, environmental degradation, and quality of life that is good for all. Science and technology are bringing about significant responses in understanding and mitigation, but the real challenge has most to do with what we value and why we should care to make a difference. Science and technology cannot impact without personal, political, and economic commitment. A greater focus on values helps form a broader social engagement that is gravely lacking at this critical point and guides our actions and decisions within the planetary boundaries. Through the promotion and deepening of this dialogue on transformative values, commitments are reinforced for a more sustainable world. 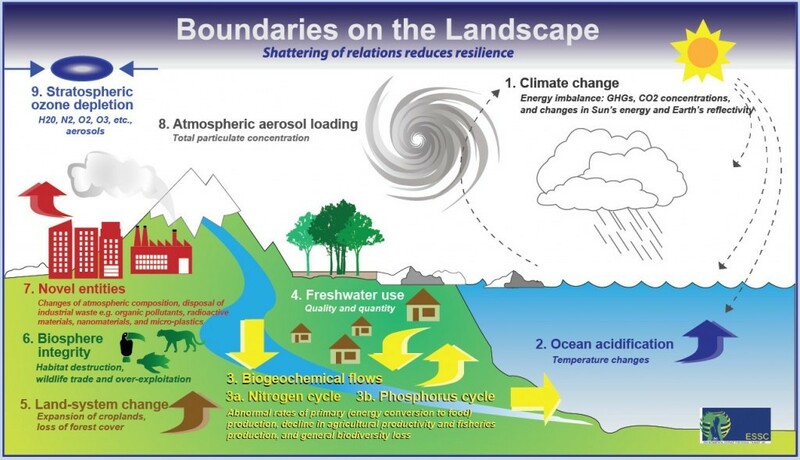 The dialogue of sustainability science shares and communicates the human concern for planetary boundaries, for a change in lifestyle, and for greater action when the environmental changes are experienced at the local level. The environmental encyclical Laudato si’ is Pope Francis’ urgent appeal for a “new dialogue about how we are shaping the future of our planet. We need a conversation that includes everyone, since the environment challenge we are undergoing, and its human roots, concern and affect us all” (#14). Care for the environment is necessary and an ongoing dialogue based on this care is gaining ground among people who are engaged in scientific research and implementation. At the same time, this global conversation acknowledges the inequalities and conditions in which people live and labor, and calls for a re-assessment of how science, technology, and business can engage with the needs. The challenge to economic development is one of justice, to evaluate its role beyond profit margins and commodification to sustainably manage resources and local economies and respond to local social needs. The science needed is also recognized as sustainability research, defined as “an emerging academic field of problem-driven interdisciplinary scholarship that seeks to facilitate interventions that foster shared prosperity and reduced poverty while protecting the environment.” (Sustainability Science Program, Center for International Development, Harvard University, 2012) It is trans-disciplinary in that science needs to develop much more effective communications and local implementation, while the focus and technological outcomes call for greater solidarity in the commitment to economic sustainability. Solidarity is a way of offering a three-dimensional connectedness of future generations, the poor, and the environment. It does not rely on reciprocity but asks for the individual to act in response to the human context. Solidarity invokes the natural and spiritual relations that sustain us, including the need to be part of the living Earth and the struggles of others whom we join so that we too may grow. From experiences of solidarity, we share learning experiences of humility and discernment and are able to express stories of hope coming from the simple context of community. Solidarity with the youth is important as they are often excluded from job markets, and are struggling for their identity and with limited support systems. We need a new way to communicate, not only in terms of social media, so that we reach the other millions of youth who are vulnerable and seeking answers on how to live a sustainable life. If the shift is to be real, we have to go deep. This requires an awakening of people to the responsibility for action now, in a way that scientists, politicians, or business leaders cannot achieve alone. In increasingly individualistic societies, there is a challenge to go beyond personal successes so as to understand one’s existence in relation to others, beyond the dynamics of competition and survival, and have empathy with others. Depth comes from consciousness, suffering, a strong sense of solidarity, active acceptance of what is happening, and identification of critical points of change. Depth gives space to consider healing (not simply bargaining and trade-offs), community wellbeing, and global sustainability. Social history calls for greater reconciliation and is not simply a matter of justice. People need occasions to express restoring relations and explore options. If we are moving with deeper commitment, the need for reconciliation with creation and the resolution of existing strife in many areas over natural resources such as water present multiple challenges beyond simply the business proficiency of our times. Believers and all people of goodwill can easily acknowledge the value of the human spirit in sharing concerns and in seeking to address environmental concerns. The spirituality of wellbeing that looks inside the self to find meaning finds connectivity with all that is around us in our landscape and with the planet. This attitude naturally opens with gratitude and humility that need to be shared in community and society. Spirituality is key in forming the scientific mind to transcend the self in a life-affirming engagement. Without the spirituality, ethics can become a moralizing attempt, lacking accountability, and with no commitment to change. Spirituality begins with wonder and gratitude for the diversity of life – its connectedness and simplicity and also its great complexity in its natural systems and cultural interplay. As one feels connected to the environment and cared for, there is a desire to nurture a sense of care and accountability while sharing a narrative of hope both of the landscape and with others. But what motivates the person to ask: “Why me, why must I change?” Changes in attitudes are not merely rational decisions that simply convert to action. People make commitments that are laden with multiple values. People choose and consciously internalize and take action in many ways and this process is determined by the values people hold. We recognize thus the need for a deeper understanding of how values are formed and communicated that is critical in guiding us along this transformative process towards justice and healing within the planetary boundaries of sustainability. This dialogue seeks an interdisciplinary approach in tackling both the environmental challenges and those of poverty and justice within the contexts of values, which affects the process of sustainability research, solidarity building, spirituality, personal responsibility, reasoning, and diversification of values. This dialogue is relevant to both science and spirituality in their contribution to a broader global shift in attitudes of greater responsibility, in simplicity of lifestyle, and inclusion of the margins. This post is also available in Spanish via Ecojesuit.